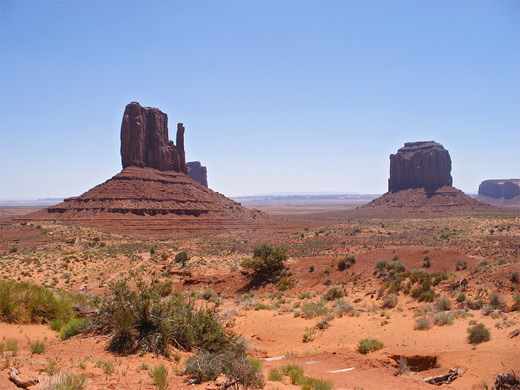 Monument Valley is not a renowned hiking location, partly as all the land is privately owned, with houses and hogans scattered over the empty desert between the red rock pinnacles, and the Navajo do not want people walking near their property. But the landscape is so vast, the buttes and mesas often well separated from adjacent formations, that walking a few miles across the flat, sandy plains generally would not produce much change in the view. The only official, maintained path is the 3.2 mile Wildcat Trail, a fairly level route that loops around West Mitten Butte so does at least allow for inspection of this rock from all angles, even if the surrounding landscape looks similar all along the one to two hour journey. 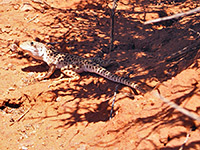 The path lies within the popular Navajo Tribal Park (entrance fee $5), though as only a few people make the journey, the hike enables a quiet, solo appreciation of the scenery, in the company only of an unusually varied assortment of different species of lizards. 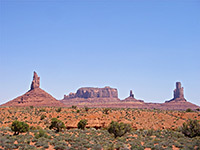 Panorama along the Wildcat Trail, from the north side of West Mitten Butte. The Wildcat Trail begins just past the Navajo Tribal Park visitor center by the edge of a large, flat parking area at the edge of an escarpment, a site also used for picnics and primitive camping, and overlooking the hill at the start of the Valley View scenic drive - so a good place to observe small cars and large RVs descending slowly over the rough places near the start of the road. The first part of the path is also in view, winding a few hundred feet down a gently sloping hillside towards West Mitten Butte, about one mile away. East Mitten Butte and Merrick Butte are to the right, a mile or two further, and to the left are the wider cliffs of Sentinel Mesa, while the horizon in the far distance is largely featureless. The path soon reaches a junction at the start of the loop section; right is the suggested direction, following beneath the south face of the butte either along dry washes or over low dunes at either side. 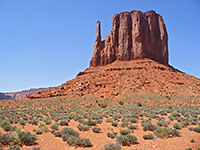 The land is quite open, bearing little vegetation; the few plants that do grow are mostly cacti and small straggly bushes. Interpretive signs identify some of the major varieties, many of which look rather similar. 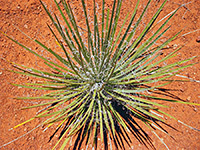 Narrow leaf yucca is one of the more distinctive types, and produces tall, pale cream-colored blooms in springtime, when a selection of wildflowers also make an appearance, though the sandy soil is not rich enough to support many species. Merrick Butte rises ever more prominently ahead as the path curves around the east end of West Mitten Butte, revealing its top to be a thin narrow ridge rather than the wide, rounded peak that appears from the south, the normal viewing angle. On the far side, the trail runs for a while along a larger dry wash, used as a 4WD track by the Navajo, then soon turns back northwest, now over even flatter ground that gives the first good view of a group of little-visited rocks to the north, including Big Indian, Saddleback and Castle Butte. 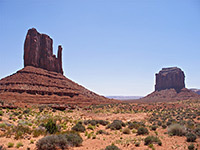 These are several miles away, but rather closer is the tall span of Sentinel Mesa that comes into view directly ahead. The hike is completed by a walk along another sandy streambed and a short climb back to the trail junction, from where the starting point is a little way further up the hill. Apart from the main butte, the next nearest peaks (Merrick Butte and East Mitten Butte) are in shadow during morning, so mid/late afternoon may be the best time of day for the hike, though not perhaps in midsummer when the weather is likely to be too hot. The path has little elevation change but is quite exposed, completely lacking any shade, and some parts have a soft surface hence the walk can be quite tiring.